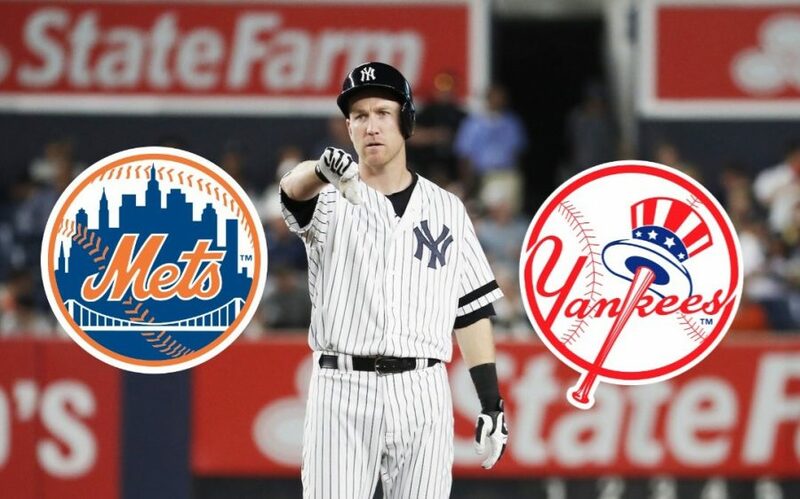 The Greedy Pinstripes: Did the Yankees Miss the Boat w/ Todd Frazier? The biggest struggle for me right now in this slow free agent market as a writer is differentiating in my posts my opinions as a rabid fan that wants the Yankees to “Get Greedy” and my opinions as the sensible sports fan that I believe myself to be. I want the Yankees to get greedy and I want the Yankees to make the big splash, but I also want the Yankees to make the under-the-radar type signings as well that solidify the team for years to come. The moves like the David Ortiz signing by the Boston Red Sox come to mind, I can remember being a huge advocate for signing him and I can also remember being in the minority on the topic. I felt like I was in the minority as well when I stated that I would like Todd Frazier back with the Yankees, and that I didn’t mind it even if it was on a two-year deal so obviously I was none-to-pleased when the Toddfather signed with the crosstown New York Mets on a two-year deal worth $17 million. Before I get too far into the Todd Frazier signing I will say this, I was one of the first to say that I was completely comfortable with heading into spring training camp with both rookies Gleyber Torres and Miguel Andujar competing for the second base and third base jobs respectively. I still stand by that, but I did also state that I wanted the Yankees to do their due diligence and try to find a veteran stop gap for one of the two positions as well, and Frazier was a name that I mentioned more times than not. Frazier makes sense for a lot of reasons to the Yankees which was why I was so comfortable with going to a two-year deal for the Toms River, New Jersey native. Frazier thrived in New York and in the American League East last season, albeit in a small sample size, and seemingly loved the atmosphere and the team. I know this isn’t something that is really quantifiable, but in my opinion, you cannot put a price tag, a number or a stat on the comfort level of a player in a big city like New York and you cannot put a price tag on someone who actually WANTS to be a New York Yankee. Frazier wants to be a New York Yankee, and it showed in my opinion on and off the field last season in the Bronx. Frazier signed a two-year deal with the New York Mets worth $17 million with the right-handed third baseman making $8 million in 2018 and $9 million in 2019. With the Yankees ultimate goal of getting under the $197 million luxury tax threshold and with reportedly $20 million left to spend for New York and Brian Cashman signing a player like Frazier would have fit into the budget perfectly for New York. Having Frazier on the team to mentor young players like Andujar and Torres would make Frazier worth the $8 million he would make this season alone, that is before any production on the field. Frazier could be a stop gap until Andujar is considered to be ready defensively splitting time with Miguel there at third base, with Greg Bird at first base as a right-handed compliment to Bird’s left-handed bat, and the designated hitter position. Frazier would have gotten enough opportunities and at-bats to make it worth bringing him onto the team this season in my opinion, especially considering the lack of a true backup first baseman currently on the 40-man roster. While Frazier makes a lot of sense for the Yankees I can see both sides of the argument. Many people will say that Frazier blocks Andujar and that Andujar doesn’t need two years of seasoning to get his defense up to snuff, and those people are right. Andujar doesn’t need two seasons, again I said I would be fine with Andujar being the Opening Day starting third baseman and I said that immediately after Chase Headley was shipped off to the San Diego Padres in a salary-clearing trade earlier this offeason, but I also don’t think it would be counter-productive either to give him a little more time in Triple-A this season either. So, what do you do with Frazier once Andujar is deemed ready? You have multiple options actually including the plan I outlined earlier letting him split time at three different positions including third base, first base and DH. The ability to trade Frazier wouldn’t be out of the question either as I highly doubt, although at the time of this writing it hadn’t been reported either way, the third baseman received a no-trade clause. What contending team or team on the bubble, a team like the New York Yankees in 2017, wouldn’t take on a veteran presence like Frazier for a year-and-a-half at basically $11 million total? Frazier would be an incredible trade asset in June or July given the fact that the likes of Bird, Andujar and Torres are healthy and contributing. I won’t lie, I am extremely disappointed in the fact that Frazier went to the New York Mets. The fan in me hates the fact that Frazier went to the New York Mets specifically, and the fan in me hates the fact that Frazier went anywhere else other than the Bronx in general. I hate the fact that he was the perfect match for this team budget wise, player personnel wise on the field, and personality/clubhouse wise off the field. I don’t like this, and I’m not happy about it. I am still comfortable with having both Andujar and Torres (after 20 games) on either side of Didi Gregorius in 2018, I just hope that the team didn’t miss out on a potentially important asset because of one year on a contract in an extremely slow market. This is my opinion, what’s yours? Leave it below in the comments section. While this saddened me it also got me excited. 1. The team is going with Andujar. Why pass up Frazier if you thought otherwise? 2. I believe the Yankees will hold off on getting a second basemen/utility infielder (for when Gleyber is ready) until they are definitely out on Darvish (they are still trying to cleac money for him) . I just posted a post that says the exact opposite to your first bullet note. If it works then they will pass on Machado and if he fails then they will sign hin Machado. I personally liked Frazier but 2 yrs guaranteed was to much. As for pitching it is coming , I think Sheffield has the talent now if he can develop the Andy Pettitte bulldog personality on the mound. Chance Adams could be another Maddox.Hits the corners has goxd control. Pitching doesn't worry me like it does most people. Sheffield and Adams will both be those midseason call ups like Luis Severino was in his first season in my opinion. The Yankees won't need to trade for one, they have two that will be ready by June or July. Maybe a little later with Sheffield. People are commenting about how eerily quiet the Yankees have been. I agree that passing on Frazier is a sign of commitment for Andujar. Yankees may like Moustakas and his left-handed bat but I don't see them spending the money and foregoing the draft picks. The ultimate would be a surprise trade of Jacoby Ellsbury (I know, not going to happen) and the signing of Yu Darvish. Otherwise, let's hold this hand and play at the trading deadline. I just posted a Moustakas article but I did not touch on the draft picks. The Yankees have the kind of farm system where they can afford to miss out on one draft pick and some international money. It is when the team goes overboard year in and year out is when the farm gets depleted. What was the old saying? Prospects are cool, parades are cooler? Also, remember, "talent is talent"! The Yankees have been very careful with the timing as to bringing up the kids. I can't see the benefit of spending money on a player we all ready have...Andujar just to get a big left-handed bat in the line-up. Well, maybe I should add "Mous" has a better glove!